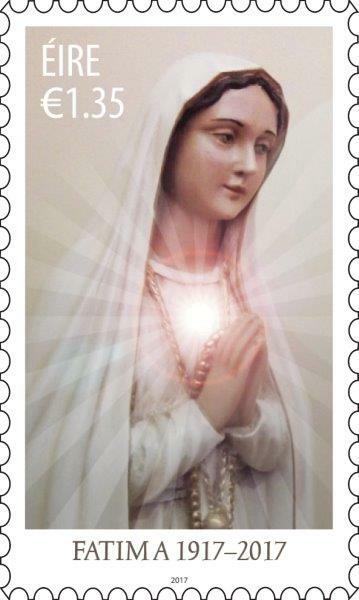 Dublin, Thursday October 12th, 2017: An Post has issued a stamp to mark the centenary at the apparitions of Fatima. The stamp, designed by 2b:creative, features a statue of Our Lady that stands in the Oratory of the Archbishop of Armagh, Eamon Martin. Bishop Martin, who is Roman Catholic Primate of All Ireland purchased the statue in 2015, when he led a pilgrimage from Armagh and Belfast to Fatima in preparation for the centenary of the apparitions. The International stamp (€1.35), along with a specially designed First day Cover envelope, is available from main post offices, from the stamp counters at Dublin’s GPO or online at www.irishstamps.ie The First Day Cover includes a quote from the sixth and final apparition at Fatima. The Fatima apparition have a particular resonance in Ireland where devotion to the Our Lady has always been high. Thousands of Irish pilgrims have been visiting Fatima each year since the 1920’s. On May 13, 1917, three Portuguese children, Lúcia Santos and her cousins Jacinta and Francisco Marto, reported seeing what they described as described as a ‘’Lady more brilliant than the Sun”. She asked them to pray every day, to bring peace to the world and an end to the Great War. She told the children she was “Our Lady of The Rosary”. The children claimed to have seen Our Lady in a total of six apparitions between May 13 and October 13, 1917. The apparitions of Our Lady of Fatima are famous for the three-part secret they carried. Of these, the ‘so called’ Third Secret is the most famous, because it remained undisclosed for many years. The secrets were revelations and prophecies about the future of the church and principally about the conversion of Russia. The stamp features a statue of Our Lady that stands in the Oratory of the Archbishop of Armagh, Eamon Martin. Bishop Martin, who is Roman Catholic Primate of All Ireland purchased the statue when, in 2015, he led a pilgrimage from Armagh and Belfast to Fatima in preparation for the centenary of the apparitions.